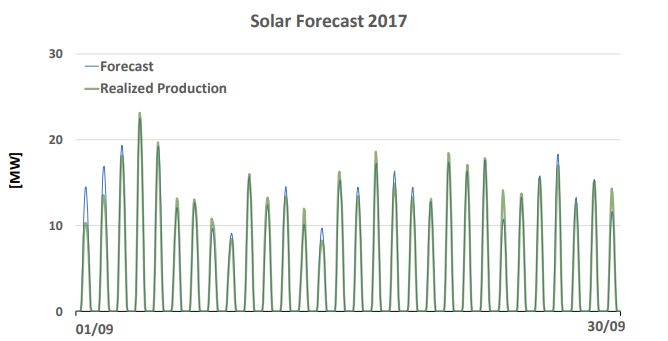 The Total Forecasting service delivers country level forecasts of wind and solar power production as well as electricity load. The service utilize the ENFOR forecasts engines for SolarFor, WindFor and LoadFor in special configuration in order to forecast production or demand for whole countries. Why do you need Total Forecasting? Total Forecasting utilizes state of the art artificial intelligence and electricity domain knowledge. With multiple weather forecasting sources as input, Total Forecasting produces market leading and highly accurate forecasting of wind and solar power and electricity load both nation wide and for individual Transmission Service Operators. By increasing forecast accuracy, asset owners and traders can better understand and manage market risk. With improved forecasting comes improved trading decisions and thereby an optimized revenue for energy traders of either conventional power production or direct marketing companies. How does Total Forecasting work? The forecast is based on a combination of our market leading wind, solar and electricity load forecasting solutions. Each of which utilizes a self-learning and self-calibrating software system that combines physical models and advanced machine learning. The self-learning and self-calibrating algorithms will continuously learn about the characteristics of the renewable energy production and electricity demand and will adapt to changing conditions, seasonal variations, and as the renewable energy assets ages. Therefore, the forecasts stay accurate over time without the need for manual configuration. To achieve this, the system utilizes the best from both worlds, artificial intelligence and electricity system domain knowledge, and combine both real-time and historical data on energy production and weather information to produce forecasts in the granularity required for the specific market. The system uses multiple weather forecast providers as input and automatically detects the optimal prioritization of the different weather forecasts for each region. The result is one of the most accurate power forecasts available. The system can deliver power forecasts in almost any file format and can be integrated directly into the operational IT-platform of the client, such that data is delivered seamlessly to and from relevant systems. The forecast is supplied with various support, maintenance and license packages, and can be tailor-made to client specifications to provide a cost/performance ratio that fits the needs of the individual client. You can find our references on the References page.